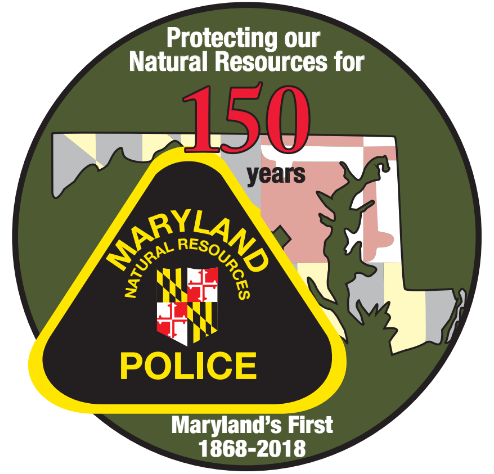 One hundred and fifty years ago today, Maryland’s oldest state police agency began its mission of protecting people, wildlife and public lands and waters. Maryland Natural Resources Police is marking its sesquicentennial with a proclamation from Gov. Larry Hogan and congratulatory resolutions from the House of Delegates and State Senate. The agency is presenting 150th anniversary commemorative badges to state executive and legislative leaders. The celebration will continue May 12, when the department holds an open house, “Great Outdoors Maryland,” at Sandy Point State Park to give the public the opportunity to see the conservation law enforcement agency in action—from K-9s units and tactical teams to simulated on-water pursuit and boarding demonstrations. Other federal, state and local law enforcement agencies and conservation and environmental groups will be participating as well. Created by the General Assembly March 30, 1868, the “State Oyster Police Force” was charged with regulating the oyster industry and bringing order to the often lawless Chesapeake Bay, where pirates stole both oysters and goods. In 1896, the legislature created the Office of the State Game Warden to extend protection to wildlife. After decades of name changes and configurations, the fish, game and boating enforcement efforts were consolidated in 1971 under the name, the Maryland Natural Resources Police. Today, the police force, with an authorized strength of 278 officers, is responsible for patrolling 470,000 acres of public lands, the Maryland portion of the Chesapeake Bay and its tributaries, the Atlantic Ocean coast and coastal bays and 9,000 miles of freshwater rivers and streams. It aids boaters in distress, locates lost hikers and hunters and provides boating and hunting safety education. Officers inspect fish that are shipped through Baltimore/Washington International Thurgood Marshall Airport, Jessup Wholesale Center and Ocean City commercial piers. They inspect Maryland-caught oysters, crabs and fish. The force has been designated Maryland’s lead agency for maritime homeland security, charged with protecting 18 locations designated by the U.S. Department of Homeland Security and nine additional sites identified by the state.